While the number you see when you step on the scales is important, it doesn't tell the whole story about your health. Body Mass Index (BMI) is widely regarded as an important additional metric in understanding and improving your chances of having a longer and healthier life. BMI is an estimation of body fat calculated by dividing your weight by your height. 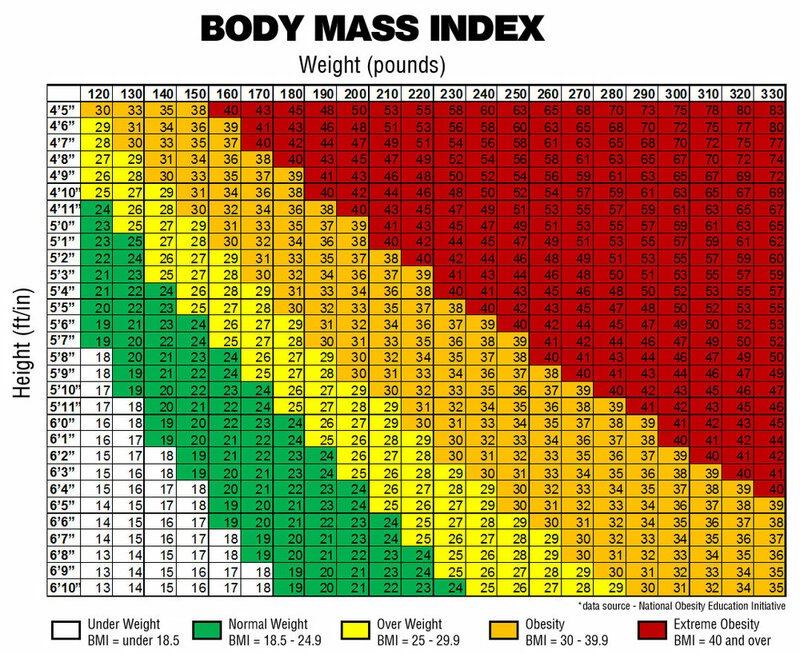 Once you know your weight and height, use the below chart to determine your BMI and calculate your overall risk. I’ve Got My BMI, Now What? A BMI of 25 is “normal,” as this is the weight which has been shown to be associated with the least amount of medical problems and longest life expectancy. A BMI of 25-30, one is considered “overweight.” This is not particularly dangerous although does show a mild increase in the incidence of medical consequences. A BMI of 30-40 one is considered “obese” at which point the diseases associated with obesity become much more prevalent, and a decrease in life expectancy is demonstrated. A BMI greater than 40 is considered “morbidly obese,” and this means that the weight causes progressive and extensive damage to the body. My BMI is Over 30, What Should I Do? Behind smoking, obesity is the second leading cause of preventable death with over 300,000 lives lost each year in the US. Clinically severe obesity has quadrupled in incidence in the last 75 years and now affects more than 15 million people in the US alone. So if your BMI reading was 30 or over, don’t despair. You are not alone. Plus, being overweight has NOTHING to do with laziness and self-control. Obesity is a chronic disease process that requires a drastic approach. Well, to lose weight and keep it off will require a radical and permanent change in behavior and environment. The NIH determined in 1991 that those who have morbid obesity should be treated surgically. The specific criteria proposed includes anyone with a BMI of 40 or greater, but also those with a BMI of 35 – 40 when associated with “significant” medical problems. The reality is that for 99% of people, non-surgical therapy (diet, exercise, meditations) simply doesn’t work. Weight loss surgery for morbid obesity, when combined with behavior and lifestyle modification, is currently the most reliable and only choice for long-term maintenance of excess weight loss. In fact, weight loss surgery produces a 96% resolution or improvement in the medical problems associated with obesity. Patients enjoy complete remission of 5-10 medical problems, often taking no more than a daily vitamin by 12 months after surgery. Bariatric surgery certainly is not a venture for the faint of heart or those who are looking for a short cut to success. Those who suffer morbid obesity know that its effects are much deeper than a list of medical problems. However, as the weight comes off, this cycle is broken, and hope and sustained change are once again possible. Join our free weight loss webinar with Dr. Custer, find out if bariatric surgery is for you, and get all your questions answered from the privacy of your own home.